The Graph view allows the interpolation between keys to be customized. When a key is selected in the dopesheet, the graph shows how the value will change from the selected key to the next key. 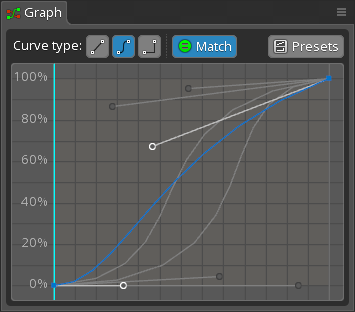 The graph will appear empty if no key is selected in the dopesheet, there is no key after the selected key, or the selected key doesn't support interpolation curves (such as event keys). The X axis on the graph represents the time between keys. The left edge of the graph is the timeline position of the selected key. The right edge of the graph is the timeline position of the key after the selected key. When only a single key is selected, the cyan vertical line indicates the current timeline position. The Y axis on the graph represents the change in value between keys. The bottom edge of the graph is the value of the selected key. The top edge of the graph is the value of the key after the selected key. The colored line between the bottom left corner and upper right corner shows how the value changes over time from the selected key to the next key. The Curve type determines how the value is interpolated between frames. 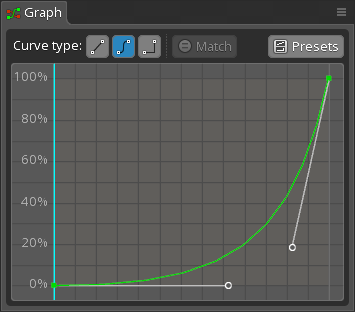 Linear is the default curve type and results in a linear interpolation between key values. This means the value changes at a constant rate when the timeline position moves from the first key to the second. The Bezier curve type uses a Bézier curve to interpolate between key values. A Bézier curve has two handles that can be dragged to customize the rate at which the value between keys changes. In the graph below, the value does not change much at first, then changes a lot as the timeline position gets closer to the next key. In the graph below, the value changes a lot at first, then changes more slowly as the timeline position gets closer to the next key. The Stepped curve does not use interpolation at all. The value does not change until the next key is reached. New keys normally are assigned a Linear curve type. However, if a key is placed between keys that are using Bezier or Stepped, then the new key is assigned a Bezier or Stepped curve type instead. When this is done for Bezier, the curve for both the previous key and the new key is adjusted to match the old key as closely as possible. This allows new keys to be added in the middle of an animation without losing the interpolation curves. When multiple keys are selected, the first selected key is drawn as normal and can be changed, but the other keys are draw in gray. 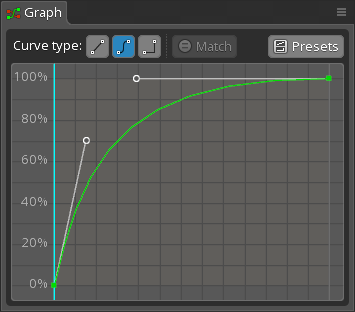 When Match is enabled, modifying the curve type or moving the Bézier curve handles will modify all the selected keys. Selecting a curve in the Presets section of the Graph view applies it to any selected keys. While a preset is selected, changing the curve or curve type in the Graph view updates the preset. Presets are added and removed using the + and - buttons and may be renamed by double clicking the preset.